This year the nation of Israel commemorates the 40th anniversary of the 1973 Arab-Israeli War. That war took place on the Jewish people’s holiest day of the year, the Day of Atonement (Yom Kippur). The Israeli strategic plan and tactical implementation during that war are often cited as an outstanding example in military history. But at the same time, it showed the ultimate futility of a military strategy in the Middle East. It became clear through the Yom Kippur War that military might alone was not enough to guarantee peace in the Middle East. Military might had to be supplemented with peace agreements and an effort to gain the hearts and minds of the people. A good way to understand the Middle East–and Islam in general–is to think of it as a “damsel” being courted by “two suitors.” The two suitors are Russia and the United States. The woman feels attracted to both sides and hesitates between the two choices. She loves them both but fears their hearts are fickle, and they are mostly interested in her wealth. One of the suitors is Russia. Russia’s dream is to create a grand coalition with the Arab nations whereby Moscow can handily exert a huge influence in the world through oil control. That dream has been, however, derailed–first, by the adoption of Communism in Russia during the long Stalin-Era; and second, by the establishment of the State of Israel, which aligns itself with the West. Communism was a deterrent for Russian influence in the Middle East because Islam abhors the atheistic view of Communist ideology. The other “suitor” wooing the Middle East is the United States of America. US interest in the Middle East has always been twofold: (1) to make sure the oil flow from the Middle East to the United States continues abundant and unabated; and (2) to maintain open and stable a vast area of economic influence for US products and know-how. The Middle East loves the US and admires its sophistication, but at the same time is seduced by Russia’s passion and impulsiveness. The difficulty for both Russia and for the United States in attaining their competing goals has been Iran–which has mostly plotted its own course. Iran in the past few decades has steadfastly refused to pledge allegiance to either side. They favor neither Russians nor Americans in their pursuit of Iranian policies and goals. Iran wants to be a major and independent center of power in the Middle East. In general, Iranian government favors Russia, while the Iranian people favors the US. A grand coalition between Russia and Iran could actually have happened when Ayatollah Ruhollah Khomeini (1902 – 1989) first attempted to take over power in Iran in 1963. Nikita Khrushchev (1894 – 1971) was the premier in Russia at that time. During the first six months of 1963, when Pres. John F. Kennedy was still in the White House, Khomeini instigated the Iranian people to revolt against the Western-leaning government of the Shah Mohammad Reza Pahlavi. With some substantial help from the Russians, Ayatollah Khomeini could have taken over Iran in 1963. But fortunately for the world, that Russian help was not forthcoming. 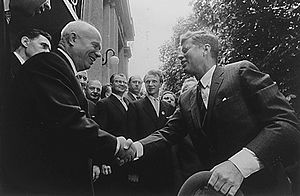 Russian Premier Nikita Khrushchev was obsessed with his confrontation against Pres. Kennedy: first in Cuba, and then in Vietnam. Since Kennedy had decided to take an American stand in Vietnam, Khrushchev must have figured out that his next confrontation with Kennedy was going to be in South East Asia. As a result, Russia began to focus its attention on Vietnam, and no help was offered to Ayatollah Khomeini in Iran. It is interesting to note that a valiant stand by an American president (John F. Kennedy) in one part of the world (Vietnam) had an effect on the other side of the world (Iran). And that was fortunate for the world. It prevented this grand coalition between Russians and the Middle East. Yes, it is true that some sixteen years later Khomeini finally took over Iran (1979)–but his golden opportunity had passed. Khomeini was older, and soon he found himself embroiled in the Iran-Iraq War (1980-1988), which pretty much consumed all of his energies and nullified him as a player on the world stage. Khomeini died in the year following the end of that war. If I may pursue a bit further the “damsel” comparison, the Middle East–as a damsel being wooed by two suitors–favors the West in its heart, but favors Russia in its ideology. The people of Iran–and Arabs in general–love the United States and the American ways. Those who go out and make huge protests against the “Great Satan” (The US) are responding to their ideology rather than to their hearts. In other words, Arab extremists hate the US with their ideologies, not with their hearts. So, going back to the Yom Kippur War of 1973, what lessons can we glean out of that war? I believe there are two lessons: (1) The West must continue a strong posture of military engagement with the Middle East as a means to ward off the ideological front against the West. And (2) the West must remember that–just like in Vietnam–the goal in the Middle East is not to defeat those nations, but rather to gain the hearts and minds of the people. In Vietnam, the US was able to gain the hearts and minds of the people by being the patient and persistent warrior with a golden heart, who refused to go away. The same strategy must be used in the Arab nations. Military strength, yes, but mostly, the US must be there.